Mark English and Ian Rogers are named 2016 Pacific Cup Champions. Kaneohe, HI — The 2016 Pacific Cup will be remembered for the big wind and seas that challenged some racers with broken boats and bodies, but pushed many in the fleet to record breaking passages in late July. Newport Beach’s Manouch Moshayedi’s super maxi Rio100 sped across the Pacific to set a new Pacific Cup Fastest Passage record. With an elapsed time of 5 days, 2 hours, 41 min and 13 seconds, Rio100 knocked two hours off the record set in 2004 by Robert Miller, whose 139-foot Mari Cha IV finished with an elapsed time of five days, 5 hours, 38 minutes and 10 seconds. The overall Pacific Cup was won by the Moore 24, Mas! Double handers Mark English and Ian Rogers pulled off a grand slam, also taking honors in overall PHRF and the Kolea Division (Double Handed 1). They also broke the previous Moore 24 Pac Cup record of 11 days 9 hours, 48 minutes, 25 seconds that stood for 18 years. Placing first in the Alaska Airlines Division (PHRF C) was San Pedro’s Shawn Ivie’s Express 37 Limitless, which also placed fourth in PHRF and fourth in the overall Pacific Cup. The division included three other Express 37s, but second went to the Farr 36 Sweet Okole who was in a tight race with Limitless for much of the crossing. Limitless was also awarded the Carl Schumacher Trophy for best performance by a Schumacher-designed boat. The Santa Cruz 50s swept the Pasha Hawaii Division (ORR D). J World’s Hula Girl, of San Diego, came in first, setting a new Santa Cruz 50 Pac Cup record and coming in second in the ORR Group. J World’s Hula Girl also took home the inaugural Bill Lee Wizard perpetual trophy for best performance by a Bill Lee designed boat. Michael Moradzadeh’s Oaxaca and Shana Bagley Howe’s Adrenalin placed second and third in the division and third and fourth in ORR. 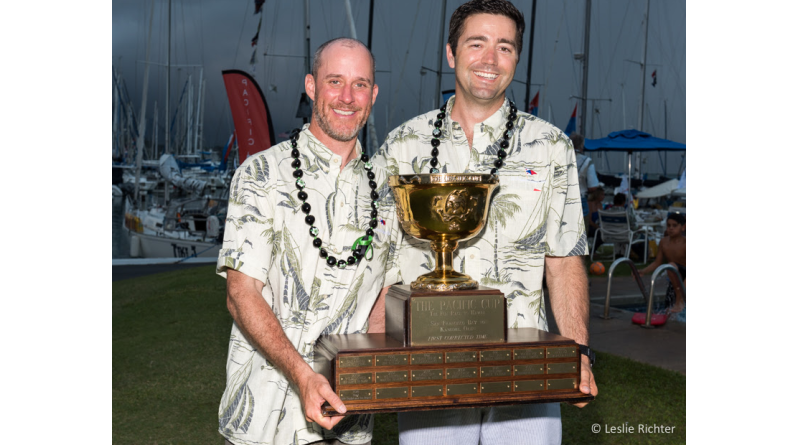 Gib Black’s Chasch Mer was awarded the perpetual trophy for First Hawaiian Boat to Finish. In the BMW of San Rafael Division (ORR E), Roy P. Disney’s Andrews 70 Pyewacket came in first, also nabbing top honors in the overall ORR Group. Edward Marez’s Santa Cruz 70 Buono Sera and Hector Velarde’s Andrews 70 Runaway were second and third in this division. More information about the 2016 Pacific Cup can be found at PacificCup.org.